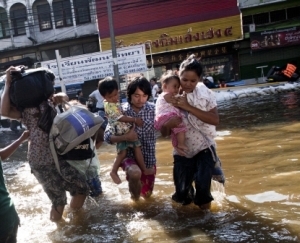 Flooding in Don Meung, one of the northern suburbs of Bangkok which has been hard hit by Thailand's worst flooding in five decades, has killed at least 356 people and affected nearly 2.5 million. Save the Children has issued an appeal for 5 million dollars to help with flood relief efforts in Thailand. The charity estimates that about 800,000 children are in need of assistance as massive floods have struck the country. Thousands of people have been forced from their homes into crowded evacuation centers. Thousands of others though remained trapped in their homes and are depending on aid agencies to reach them with food, clean water, medicine and other supplies. Save the Children has been making deliveries of life-saving supplies to those trapped by the floods. They are also helping children in the evacuation centers. The flooding has destroyed livelihoods and hunger and poverty will threaten many for months to come. Aid will be needed to help thousands who will suffer without an income and will struggle to afford basic necessities. You can donate at Save the Children’s web site. This summer I interviewed Save the Children’s Annie Bodmer-Roy about the post-conflict recovery in the Ivory Coast. She is now in Thailand helping children who are suffering from the massive flooding that just struck there. Hundreds have lost their lives in the floods. Damage, which includes farming areas, is estimated in the billions of dollars. Save the Children is distributing food in Thailand and setting up child-friendly spaces. The psychological toll of going through a disaster is hard enough at any age. For children the trauma is magnified. Amid the chaos of the flooding it is also tragically easy for children to get separated from their parents. Save the Children is working to prevent this and help keep families together. To learn more about this fast developing crisis read Annie Bodmer-Roy’s post at Save the Children UK.